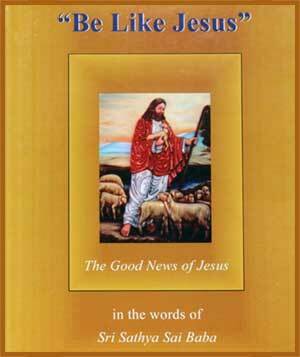 Be Like Jesus is an excellent compilation of Bhagawan's messages delivered on various occasions elucidating the life, times and teachings of Jesus Christ. Mrs. Debra and Mr. William Miller have painstakingly perused through scores of discourses of Bhagawan, classified them and presented this immortal content through the “Beatitudes” - the life lessons that Jesus gave mankind during the Sermon on the Mount. The book begins with Baba exhorting us: “Try to be like Jesus. Jesus was a person whose only joy was in spreading Divine Love, offering Divine Love, receiving Divine Love and living on Divine Love.” Reproduced below is the seventh chapter of Be like Jesus. Without pain, one does not realise the value of pleasure. The value of light can be realised only when there is darkness. This message of truth must be taught to the entire world, as it was the teaching of Jesus. One has to overcome difficulties to be successful in life. What is happiness? True happiness is that which is related to God. The yearning for bliss is the best proof of our holy nature. Man is bliss; he seeks bliss, and bliss is blessedness for him. Since God is bliss, happiness is union with God. Nothing else can award that joy which is unaffected by whatever happens or does not happen. Never feel depressed when you are weighed down by difficulties. Difficulties are part and parcel of the lives of great devotees. God subjects His devotees to tests so that their faith in Him can be strengthened and their hearts purified. However, God will never impose suffering on you that you cannot bear. Difficulties are meant for cleansing the vessel of your heart. Do not be afraid of difficulties as they are like passing clouds; do not waver. Follow your heart, which is steady and unwavering. Some people accuse, criticise and censure God in times of difficulties. Do not blame others or impute partiality to God. Above all, do not rely on this impermanent objective world; it is full of sorrow and change. Each one has to bear the consequences of one’s own actions; none can predict when and how, but one is bound to face them. “As you sow, so shall you reap.” There are no defects in God. All words and deeds of God are perfect. You see the reflection, reaction and resound of your own feelings. They are psychological in nature. Understand and experience this truth that God always gives good alone. Above all, whatever your difficulties, whatever the ordeals you have to undergo, in any situation, do not give up God. God is One. 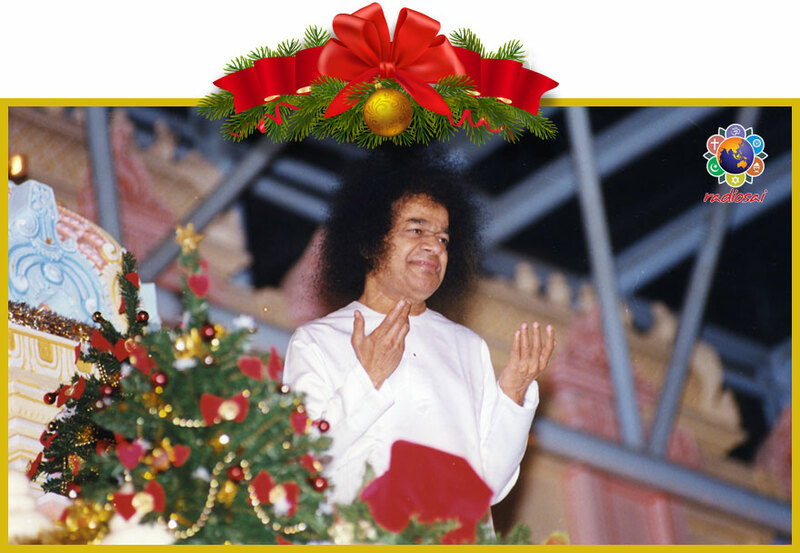 Whether you are affluent or destitute, whether you are a scholar or an ignoramus, whatever troubles you may be faced with, whatever spiritual practices you may adopt, whether you are regarded as a sinner or a saint, “Do not give up God. Realise that God is One.” Give solace to those who are distressed. Jesus performed many miraculous deeds, relieved the suffering of many in distress, preached sublime truths to the people, and ultimately sacrificed his life. He was compassion (karuna) come in human form. 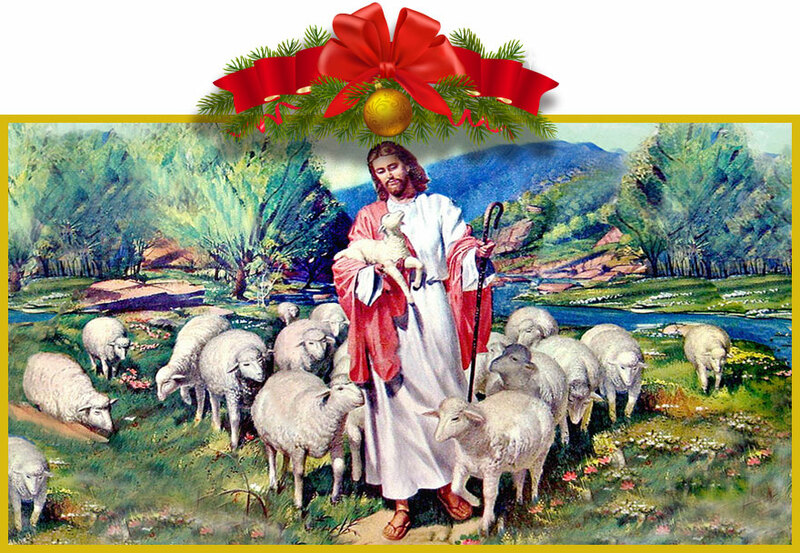 He spread the spirit of compassion and conferred solace on the distressed and the suffering. The Lord alone is the saviour of the helpless and the forlorn, so do not waver in your faith in the Lord in any circumstance. Go ahead with your tasks with faith and determination. There should be no room for any kind of differences in rendering service. There are persons, good and bad, rich and poor, educated and uneducated in every country of the world. Every human being has equal rights in the world. All belong to one family. Service should be the guiding principle. When you wish to serve society, you must be prepared to sacrifice your individual and communal interests. All religions and scriptures agree that going to the aid of fellow-beings in times of need and saving them from distressing situations is the greatest virtue of a person. What Jesus preached was in accord with these basic teachings of all religions. Seeing his acts of love and kindness, people declared that he was a “messenger of God”. Give happiness to those who are suffering and consider every activity as God’s work. Wherever you may be, go into the society and render social service in all possible ways, with faith in God and in a selfless spirit. The fulfilment of human life consists in the service that man renders, without any thought of return, in an attitude of selflessness. Service rendered in this spirit sheds light in the dark interior of man, it widens the heart, and it purifies the impulses and confers lasting bliss (ananda). By way of illustration, Christ told the following parable: In a river the water is flowing in a swift current, yet even the tiny fish is able to swim in it and move about merrily. In the same river, a huge elephant caught in the rapids is likely to get washed away or drowned in spite of its enormous size. Whatever the speed of the current, the small fish is able to swim freely in the river and enjoy themselves. But an elephant is unable to survive in it. The reason is: what you need for survival in a river is not bulk, but the ability to swim. 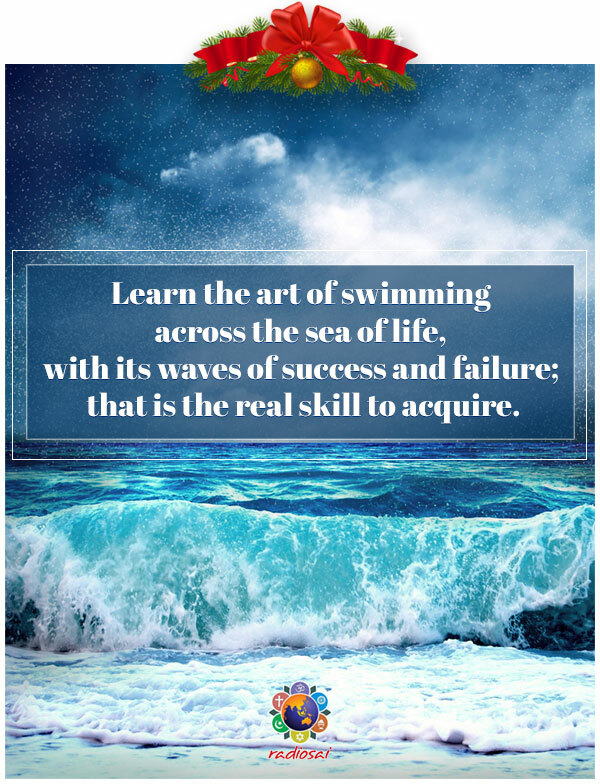 You too must learn the art of swimming across the sea of life, with its waves of success and failure; that is the real skill to acquire. All who are crossing the ocean of worldly life need to cultivate the art of swimming through contemplation on God. However learned you may be, if you do not have this training and cultivation, you are bound to sink. Likewise, if you are caught up in the ocean of worldly existence, you need not so much metaphysics, scholarship or detachment, as the grace of Divine love. God takes upon Himself the pain and sorrow of the world in order to prepare the hearts of men for love! But, when you look at the truth squarely in the face, you will know that in God there is no “suffering” and that you too have no reason to suffer! The entire world is the play of love! You suffer on account of love. It is love, love, right through – there is no reason for sorrow or pain or suffering! So, when you constantly think of God, you will never be put to suffering. God will shield you from all suffering. He will always be with you, in you, around you, safeguarding you. God remains unaffected. God is pure, unsullied and sacred. At the time of His crucifixion, Jesus prayed, “Oh Father, what sin have I committed? Why do You make me suffer? Please help me.” Then an ethereal voice spoke to Jesus thus: “My dear son, why do you worry? All are your brothers. You are thinking that you are being put to suffering by your own brothers. In fact, it is not suffering. Whatever happens is good for you. So, accept it cheerfully.” At that, Jesus attained the state of tranquillity and quietly closed his eyes.